*Due to a policy amendment of Tokyo metropolitan government, NO tour of inner wholesale fish market. Take a fascinating 'deep dive' into Japanese seafood cuisine during this 3-hour combination walking tour of Tsukiji Outer Fish Market and cooking class. During your time with us, wander through what locals call "Tokyo's stomach", as you experience the sights, sounds, and of course TASTES of native culinary traditions. There, you will learn how to cook authentic Japanese meals at the largest cooking school in Japan. Top off the tour by enjoying your own creation for lunch along with a copy of the recipe and a small gift to take back home with you. Meet your local guide at Tsukiji Honganji Temple at your designated time and get ready to start off with a walking tour of the world famous Tsukiji Market (approx. 1 hour). Not only will your guide inform you of the market’s long history, but also why many of Japan’s top chefs continue to make the daily pilgrimage for the freshest ingredients of the highest quality. You never know what you might find as you stroll past the stalls of what locals describe as "Tokyo's Stomach"; We encourage all guests to be adventurous and try as many things as they would like. Our guides will help you make purchases or find desired items to the best of their abilities! *Due to a policy amendment of Tokyo metropolitan government, NO tour of inner wholesale fish market. We may spend approx. 80 min at outer shopping market and Namiyoke Shrine instead. If time allows, we will be making a stop at the Namiyoke Shrine, the most significant area of worship in the area. You will learn proper Shinto etiquette and the proper technique of prayer. Moreover, you will get to take home with a fortune slip that will tell you the nature of what awaits you! After approx. 1 hour in the Tsukiji Market, we will make our way to the cooking school. Learn how to prepare some of the most authentic washoku(Japanese dishes), sushi rolls, egg omelet along with Japanese soup. 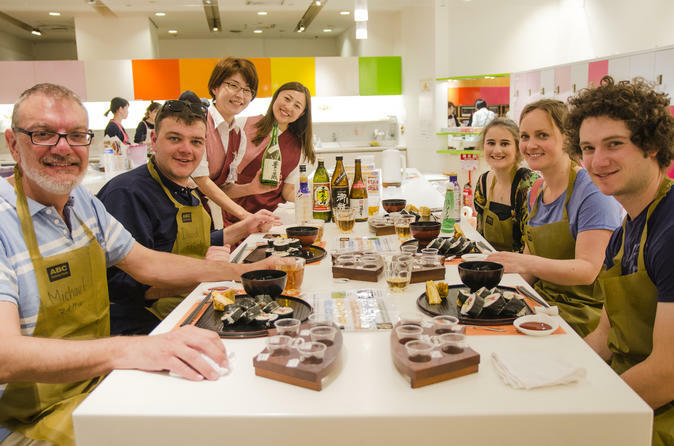 Learn various Japanese cooking techniques from your licensed, professional instructor and experience the essence of authentic Japanese flavor and spirit. Finish it all off by digging in to your culinary creations and complimentary Japanese alcohol provided by your guides. If you select Exclusive Private option, we'll blockout the tour just for you. Capacity is 1 to 6 person(s). Private guided tour at Tsukiji Fish Market (please select AM or PM after your booking will be confirmed), followed by private cooking class. Please note that other ABC Cooking Studio members will be present in the cooking studio, however, you will be provided a private instructor as well as a personal station. Great option for honeymooners and family travelers with kids!